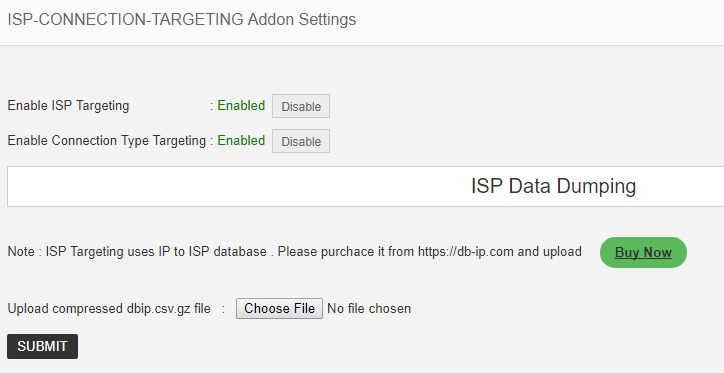 Upload the Connection Type and ISP Targeting Addon to the “addons” folder in XYZ Admarket script. In the “Manage Addons” page please activate the Connection Type and ISP Targeting Addon. Now edit the settings page and upload the ISP database. Create / edit an ad. In the “Manage Targeting” section, advertiser can see the “Connection” and “ISP” tab. In this section advertiser can select the connection type and ISP type. In the connection type advertiser can select the connection type and submit. The ad will display in these selected connection types only. In the ISP section advertiser can select the country and the ISP types from the list.